Wilmington, NC: AAA Carolinas recently announced its 2018 AAA Four Diamond North Carolina recipients. Three Wilmington hospitality businesses have once again received the coveted recognition. Two premier bed and breakfast inns located in Wilmington’s River District earned AAA’s prestigious Four Diamond ratings for superior customer service and facilities: The Graystone Inn (19 consecutive years) and The Verandas Bed & Breakfast Inn (16 consecutive years). Manna, a Wilmington restaurant, is also honored for the fourth consecutive year. AAA Carolinas presented awards to 17 hotels and 9 restaurants in Central and Eastern North Carolina at the AAA Four Diamond ceremony at The Carolina Inn in Chapel Hill on Wednesday, January 15, 2018. AAA Diamonds are a traveler’s best friend. According to AAA Carolinas, requirements for Four Diamond ratings are rigorous, and those that achieve it are among the finest restaurants and hotels in the country. Less than four percent of thousands of annual inspections conducted nationally result in a Four Diamond rating. The Graystone Inn (100 South Third Street, Wilmington), formerly the Bridgers Mansion (c.1905-06), exudes turn-of-the century elegance. Innkeepers Richard and Marcia Moore purchased the 14,300 square-foot mansion in 2004. The elegant bed and breakfast inn welcomes guests and is available for weddings, receptions, and events year-round. The grand historic landmark has appeared in movies, television shows and hosted notable personalities. For reservations call 910-763-2000 or visit graystoneinn.com. The Verandas (202 Nun Street, Wilmington) is a Victorian Italianate Mansion originally built in 1853 by Benjamin Beery. The boarded-up mansion was purchased in May 1995 and restored by innkeeper Chuck Pennington and the late Dennis Madsen. Decorated with American, French and English antiques and original art, each room has a distinctive style. Since opening its doors on Valentine’s Day in 1997, the inn has appeared on the silver screen and hosted celebrity guests and dignitaries. For reservations call 910-251-2212 or visit verandas.com. Also located in Wilmington’s River District, manna (123 Princess Street, Wilmington) serves new American cuisine with innovative menus and cocktails. From the moment guests enter the stylishly appointed restaurant, they are treated to an extraordinary dining experience. Fresh local, regional and American ingredients are used to create exquisite menus. Owner/general manager William Mellon and the manna staff work tirelessly to maintain originality in concept, uniqueness in wine selections and attentiveness to all the extra details that make manna a destination dining experience. For reservations call 910-763-5252; mannaavenue.com. 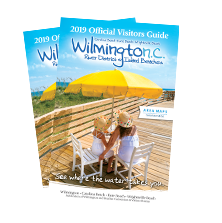 For a free 2018 Official Visitors Guide for Wilmington, N.C.’s River District and the island beaches of Carolina Beach, Kure Beach, and Wrightsville Beach, contact the Wilmington and Beaches Convention & Visitors Bureau at 1-866-266-9690 or download the digital version.